Book Review: I remember hearing about this a long time ago while watching a show called Dark Matters: Twisted But True starring John Noble. It had been part of three stories during the second season (?). So when I saw this book pop up at my local bookstore I decided I really wanted to check it out. I was not at all disappointed by this book. The book was heart-breaking and tugged at every emotion within your body. 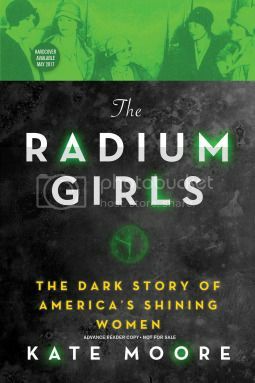 You felt the pain these girls went through and the anger at Radium Corp for covering up the dangers of the radium. These young women went to these jobs to earn a living. Most of them came from poverty and were trying to lift not only themselves out of it but also their families. This job offered them that opportunity but when these girls grew ill from the effects of lip dipping, Radium Corp tried to cover it, blaming it on their choices in their lives for growing ill. Seriously? In the end, most of these young girls died broke as well as some of their families trying to figure out what was causing their illnesses and death. This book was so thoroughly researched and fascinating and made you feel part of these girls' pain. You felt the heartbreak and the genuine need to understand why these girls were growing ill. This was a fascinating look at the turn of the early twentieth century where radium was the new rage. Clothing, beauty products, and every day needs had radium now part of it. A look at a world who still had no idea of the dangers it possessed and those that knew did nothing to lift a finger to help these girls. If you are looking for a book dealing with this part of history, then you will definitely find yourself immerse into this book.